Last week, during circus camp at Lone Star Circus, one of the anchors from WFAA TV (ABC-Channel 8) here in Dallas came to class. Her name is Colleen Coyle, and she worked out with my coach, Alora Scavella, on silks, trapeze, and the lyra (ring) before jumping into the ball pit. This morning, Jesse Patterson, Morgan and Megan McKenyon, and I got up super early and went downtown to Victory Plaza where the TV station is located, and performed for awhile as part of the show featuring Colleen Coyle. Here’s a link to the video they shot of Miss Coyle at circus camp, and of us on the plaza. The funniest thing about this is that the plaza is an open space between three buildings — one of the buildings is American Airlines Center, the big arena where the Dallas Mavericks and Dallas Stars play, and where the Ringling Brothers Circus performs every year. It’s also where they have big concerts like Justin Bieber or Beyonce. The other two buildings are office buildings, but they have these giant 3-story tall screens on them, and the TV station broadcasts onto these giant screens. So while you’re juggling at the south end of the plaza, by the TV station, giagantic versions of you are on the sides of the buildings in front of you. It’s very distracting! Also, the camera crew is right next to you — so close that I was afraid I was going to hit them with the diabolo. Check out the videos at the bottom of this post if you’ve never been on TV and wonder what it looks like when they’re actually filming it. Jere I am with Morgan and Megan McKenyon (in red, in front) and Jesse Patterson at Victory Plaza in Downtown Dallas. 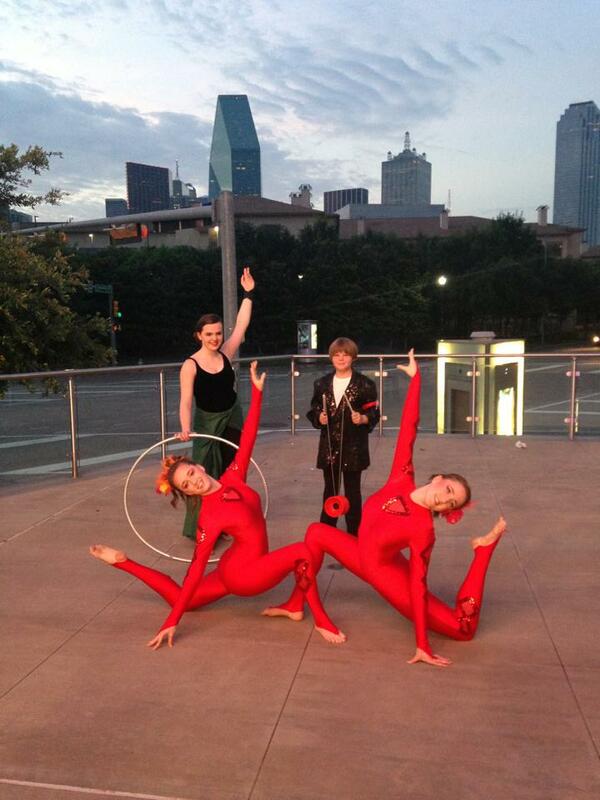 We had to be there at 6 a.m. for the Daybreak show on WFAA TV (ABC-Channel 8) featuring the Lone Star Circus School. There’s an other session of summer camp at the Lone Star Circus School, July 15-19. Kids from 5-16 can run away and join the circus — for half a day at a time — and learn all kids of fun skills. Check out the details at the Lone Star Circus website. Or, just come to one of the classes the school offers: juggling, character development, contortion, aerial silks, and so on. ← 31 Days to Circus Smirkus!